Please use this thread to discuss applications for electrically powered bicycles. it's a weird thing for me. i kind of scoff at them and at the same time i think they can be OK.
my issues with them is they don't give you health, or happy endorphins. to me it's taking the best thing out of cycling leaving you with just the fresh air. my other issue is 95% of the electric bikes out there are absolute junk and fall apart. there's not many electric bikes out made to last or even ride nice. one really nice setup is the Stoke Monkey electric upgrade to the Xtracycles. it's high quality and really helps with the heavy loads. it's expensive but the quality shows. I've never felt sure of what to think about them. They do seem kind of odd. A big part of the reason I ride is for exercise, and they take that away so the idea doesn't really work for me. OTOH I don't see any particular problem with other people using them. I tend to think that anything that scales down personal transport is a good thing. I'd feel much safer riding my bicycle on a street full of 50 lb electric bicycles rather than 4000 lb SUVs. I don't think that people who would otherwise ride bicycles are going to ride electric instead. I believe that electric bikes may appeal to people who would otherwise be driving cars. So for that reason, I'm all for um. Also, since they are the same relative size as bicycles, if they grew in popularity maybe car drivers would learn to respect other forms of transport a little more. ... cargo bikes e.g., xtracycle as they really improve the range and load capacity. That stokemonkey looks real nice. ... professionals who are looking to get out of the car and commute by bike to work. I think the most cited excuse for not bike commuting is the "I don't want to arrive sweaty" excuse. No more excuses. ... the elderly as they can get to and fro on a bike with less effort yet still get good exercise. ... those with a physical disability who use a recumbent/trike or similar. Provides excellent mobility and while helping them to keep pace with the able bodied cyclists. Electric bikes should use their super powers only for good, not evil. I wouldn't mind them when used by people who are already proficient cyclists. A beginner or novice on an electric bicycle seems like a bad idea. Not only for the user but for other cyclists. This is a little of track, but I heard at least one vendor at Earthfair pitching his electric scooter (scooter like a Razor scooter on roids) by saying you could use them on bike paths. It kind of made my blood boil. Out of the box the thing can go 20mph, so who knows how fast they can really go. I don't know what to think yet about them. Part thinks "yea! more riders", part thinks "whoa, go fast with no experience" and.. then the whole division "electric bikes aren't REAL bikes" that will pop up. I'm sure there will be growing pains as with anything. The bikes themselves are fine, but I've never had a smile or wave returned by anyone on an electric bike while riding. I don't think the question is so much whether *we* consider them part of the bicycling community, but whether they consider *themselves* part of it. That, more than anything, might prevent their acceptance by the larger bicycling community. From an "alternative" transit perspective, though, I think they're neat, even if I wouldn't personally choose one. I think I saw one the other day and wondered why rider's cadence was off (she was going up the same hill I was). I dislike them for the same reasons mentioned above, but I like them because of the human connection possibility. Not sure how to explain this...but I like the fact that one can look them in the eye when making decisions. Sometimes at intersections, it's hard to tell whether someone hiding behind glass (tinted or otherwise) has seen you. So even if they're frantically motioning you to go, I can't see their hand moving either because the sun is hitting the window glass or it's just too dark to see properly. I prefer non-electric. That said, there is a huge class of people (say, new to cycling, or less in shape) that can extend their range or simply make the bike more practical for more trips. I have three young kids, and my wife would absolutely love to not have to drive to local destinations, but the hills in our area make that impractical for her. I can pull the kids (low-geared hybrid), but that's because I ride those hills more or less daily. I'm not going to look down on someone for using a motor. Came across this article about e-bikes on CNN today. Better than those 2-cycle gas conversions. Apropos of this thread, I posted an open thread about electric/motorized bicycles on Bike San Diego this week that people here might like to contribute to. So far, interest has been minimal, so if you are moved to say something about the subject in another place, head on over and put in your two cents. Nov 2008, my company downsized but I got a hefty severance pay for 10 years on the job. So I took some time off while looking for the next job. I had a company vehicle for servicing robotics equipment. I enjoyed not having car payments, insurance, maintenance and repair, gas, and other car related expenses. Transportation was foremost in my mind: How am I going to get around? My wife drives a Prius but she worked at Scripps Torrey Pines. We tried using the Prius the first week wherein I'd take her to work then dropped off my son to school. After doing that for two weeks, I was logging almost 100 miles a day behind the wheel. That did not work for me. Getting a second car was out of the question. But I considered getting a small scooter once I find another job. I wanted to ride my bike more and yet take Nic to school (he was 7 yrs old then at 70lbs), do errands, and ride some more. Fortunately, there is a local distributor of electric bike kits in SD. So I invested $500 last Dec 2008 to get the Wilderness Electric kit (electric wheel+36V SLA batteries + controller + thumb throttle) and Electrified my Bianchi Xtracycle. Since my commute had less than 10 miles each way, the electric kit was perfect for my needs. So I used this setup to take Nic to school and back, to the library, to the market, post office, beach, etc. As I got comfortable with the capability of the electric Xtracycle, I slowly increased my travel distance. There was no excuse to ride! So I used it everyday for three months which paid for the investment rather than paying for gas. It's been a year since I bought the Electric kit and I still enjoy riding it for the small grocery items and other errands. It's a great conversation starter at the Farmer's market and in around the coastal town of Carlsbad. My friends see me biking all the time that they wondered if I ever owned a car. I have not owned a car since 2004 and I enjoy having more money in the bank ($600-1000/ month) - So I can buy more bikes (just kidding). If I needed a car I could always ride my bike to the Rent-a-car place nearby, take a taxi, bus or call a friend for emergencies or wait til the weekend and borrow my wife's Prius. (She owns the car since she's making the payments or until she completes the payments). I bet it is pricey. It takes a fat wallet to afford bad taste. Cool toy ! Perhaps a great off-roader but who would want to lock this up outdoors? markphilips: Nov 2008, Getting a second car was out of the question. It's been a year since I bought the Electric kit and I still enjoy riding it for the small grocery items and other errands. It's a great conversation starter at the Farmer's market and in around the coastal town of Carlsbad. My friends see me biking all the time that they wondered if I ever owned a car. See the next incarnation of my electric Xtracycle in the cargo bikes thread. I still use it every morning to take my son to school. It sure beats other parents who drive their car under half-a-mile to take their kids to school. Every morning, I hear countless "cool bike" when I pass all the cars at the stop sign and when I roll in the bike parking area. Wheel motor and batteries still going strong two years and eight months. I don't get commision on any sales from SDelectricbikes.com but I support them because they are local and carry great products. I have had my Wilderness electric assist motor since Nov 2008. * You want to get to work faster than a regular bike or a car in heavy traffic..
* You want to ride with more power & little effort up those steep hills. * Your work is up to 20 miles each way. * You want a 3-wheeled trike-bike with both stability and power. * You have a disability and want to get back on a bike. * You lost your Drivers License. 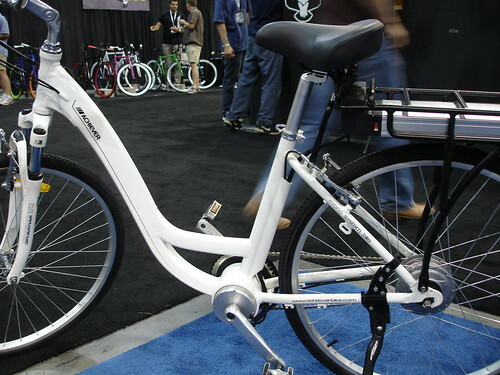 * SD Electric Bike is able to keep prices very reasonable due to low overhead. proper bike maintenance, & battery performance at our meetings. Allows for power-assistance from the motor whether you pedal or not. We can modify any Bike to your preference. internal parts resulting in a motor that will last for years. the torque is immediate, on demand. Electric motors are quiet and give you an entirely different feeling when riding. road with ease and are welcomed in most communities. There's no grease or oil to get to get your hands or clothes dirty. an electric vehicle in your home or apartment. I hope more commuters who shy from riding a bike to work switch to these electrics. The more "fellow travelers" we have out there, the better our facilities will get. I can also see regen systems being ideal for cargo bikes and Velomobiles. I am getting a Surly Big Dummy with a Stoke Monkey electric kit. Im kind of stoked about it. A cargo bike with electric assist means I can haul more with my bike and for longer distances. It's also pedal assist so I still need to pedal. You only use it to assist you when climbing or starting from a stop when loaded heavy. Im not really a fan of sitting on a bike and pushing a button but if it gets more people riding than I am OK with it. Velo Cult: Im not really a fan of sitting on a bike and pushing a button but if it gets more people riding than I am OK with it. Exactly my feelings as well. But I still get annoyed when one of them zooms by me on my ride home or up Torrey Pines. Can't help it, I am weak! I even yelled "cheater" at some of them. I simply cannot bring myself to accept them completely as cyclists. They're riding a moped, not a bike. At least the electric ones are quiet. The gasoline ones are really annoying. That looks like a MTB with a bunch of plastic bolted over the top. I'm nuetral on electric bikes. But I'm a curmudgeon often times. It is possibly a selfish feeling that some people will call themselves "cyclist commuters" having not pedaled the entire distance; and while I try very hard to be humble and pummel the internal "holier than thou" attitude, it pokes it's head up at the electric bike and makes me want to say something. Damm inner voices. If you ask me at the end of my ride on the way home, when the last portion (.75 miles) is up hill, I'd love a little assist. It's evolution, and frankly, I'm skeptical but welcoming. We had bikes before cars...I just hope the electic bike doesn't mush us further into the curb lane. billd: At least the electric ones are quiet. The gasoline ones are really annoying. Saw some JACKASS salmoning on Balboa on the sidewalk doing around 30mph on one of those gas-powered abominations the other day. I really wanted to do society a favor... but just hoped that he didn't kill anyone. You said it much better than I ever could William! But where I draw the line as well are those gas-powered machines. Not only are they annoying and are usually ridden by that "special" kind of rider but most of them are also dangerous as hell. They basically slap an engine on a cheapo beach cruiser without doing anything about the brakes or the frame itself. Almost like putting a V8 in a Yugo. One can only hope that they only take themselves out with that machine but you just know they're going to plow into a group of kids when the brakes fail. One surefire way to reduce the number of those machines would be to require a full motorcycle helmet and a license plate (plus registration fee) and seriously enforce that. But I guess we need a couple of serious accidents before that is even discussed. I love the last part of my ride home, the climb up Alga. It has made me a better rider and has improved my condition measurably. t.e.d: Saw some JACKASS salmoning on Balboa on the sidewalk doing around 30mph on one of those gas-powered abominations the other day. I really wanted to do society a favor... but just hoped that he didn't kill anyone. 30mph on the sidewalk is insane. I hate people like that. If you have to ride on the side walk, at least keep the speed low (like 6-8mph at most). I'm not sure it qualifies as true salmoning. Sidewalks are usually direction non-specific. Still, the main danger to wrong way riders is right turners coming off cross streets and drive ways. That problem is even worse on the sidewalk than in the road. 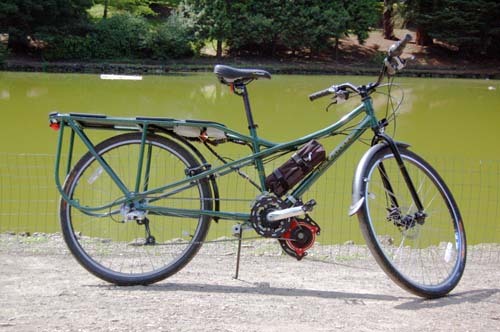 Velo Cult: I am getting a Surly Big Dummy with a Stoke Monkey electric kit. Im kind of stoked about it. A cargo bike with electric assist means I can haul more with my bike and for longer distances. It's also pedal assist so I still need to pedal. You only use it to assist you when climbing or starting from a stop when loaded heavy. Im not really a fan of sitting on a bike and pushing a button but if it gets more people riding than I am OK with it. The Stokemonkey is definitely the more efficient way of electrifying an Xtracycle. Price-wise it is still up there with Bionex. This is probably the cleanest E-bike I've seen. It will be easy to convert this to an Xtracycle cargo bike. Now I just wonder where they manufacture the motor? The first thing I look at is where can I get part replacements or repair expertise. The good thing about that is you can use a smaller, lower power motor by virtue of having it power a gearbox as opposed to a direct drive. Electric Cyclery has been around for several years and this year they have expanded their store. So I take that business is good for them. Most bikes in the U.S. are built for recreation in mind, not as vehicles that can replace cars on short trips. Basically, bikes are missing two things: storage space, and an electric motor help you go swiftly across town. That’s where the Stokemonkey comes in. It’s an electric motor kit that works in tandem with an Xtracycle. (Don’t know what an Xtracylce is? (See this previous post). Xtracycle gives almost any bike great cargo capacity, and Stokemonkey gives you the power to haul it over mountains or swiftly across town. What is BionX? Canadian made electric assist conversion kits. This is the only e-kit i know that has the regenerating feature available. It's a little less expensive than the Stokemonkey. Most lighter weight e-bikes uses the BionX because of it's compact and integrated design. That Kona (with or with out the electic assist) looks pretty cool. I have been commuting with the BionX on a touring bike for the past year and a half and it has been a blast and I was able to justify the expense as I have been car free again for the past few years. I bought it because my daily commute was heading into the strong headwind on the SD river to OB. I ride with full panniers and can keep my speed at 20mph while peddling into wind and up hills. It has a throttle for standing loaded starts like I do going up Texas street from my clinic in Mission Valley. I recharge the battery and get nice resistance going down the hill. It really performs well, charges fast and has worked perfectly every day...I can bring it by VC sometime if any tall people want to try it. I still have a few other bikes to ride for fun and I did commute on a single speed for years so I deserved a break at my age. 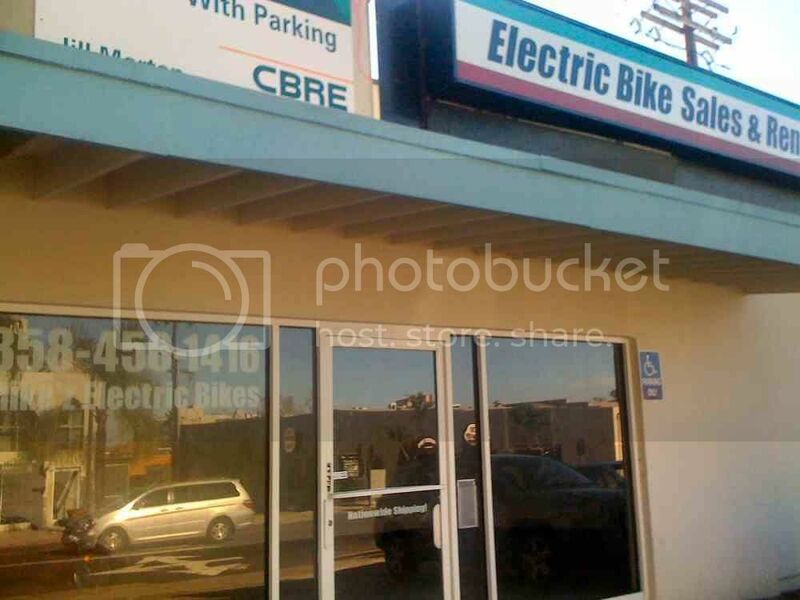 There's a new (1.5mo old, probably) electric bike store in La Jolla on Pearl St. I saw some of their bike rentals during the Challenge Athletes Foundation event in La Jolla last weekend. I'll post pics soon. The key feature of our Electric Mid-Drive and Mountain Drive is that they drive a bike's chain. This allows the motor to "see" most or all of a bike's gear range. What that means is that performance is radically increased compared to single speed drives such as hub motors. You can climb any hill and go as fast or faster than the law allows -- all with a small and light motor that doesn't detract from pedaling performance. PRICE to expensive? compared to what? 5) Perhaps ordinary people and family are cash-short because of multiple vehicles in the familly. It's the main transportation for most in North County. Nothing wrong with that, and I still drive the car. I finally saw another recumbent on my ride up Alga today ... I've NEVER seen another recumbent on it. IMPRESSIVELY Fast. He was on a EZ1 with a front fairing. Just rode by and found that Mike'z E-Bikes on Pearl St. is shuttered. The merchant next door informed me that last Saturday was his last day. That's probably the 3rd e-bike store that closed within the last year: 1 in o'side, utc, and mike'z e-bikes. There's still a few that's still in business.